Three days in (this was the 26th July) and the boxes don’t seem to be diminishing. In fact I could swear they multiply in the dead of night. Most appear to have their contents spewing for their contents like a ripped apart robot. Everywhere I look there is ‘stuff’. I have to say I thought I had got rid of lots of our ‘stuff’ in England – clearing out one cupboard after another, even persuading Tilly that she didn’t need to keep all of the paper, bags, used stickers and broken bits that formed her own private scrap yard. It appears though that I am massively mistaken. The ‘stuff’ I cleared was merely the tip of the slag heap. We also have next to no storage space in our new home aaaaaaaarrrrrrrgggggh. I have unpacked three boxes of clothes. Then repacked 2. The rest of the clothes boxes are sitting there, looking at me, slowly screwing every item of clothing into tiny little balls. Every item of clothing has creases that have creases, even my bras have creases. I cannot fight the crease. I will embrace the trend in Box City to wear the crease for the rest of the season. I wonder if it is a badge of expat honour, or a cry for help?!? 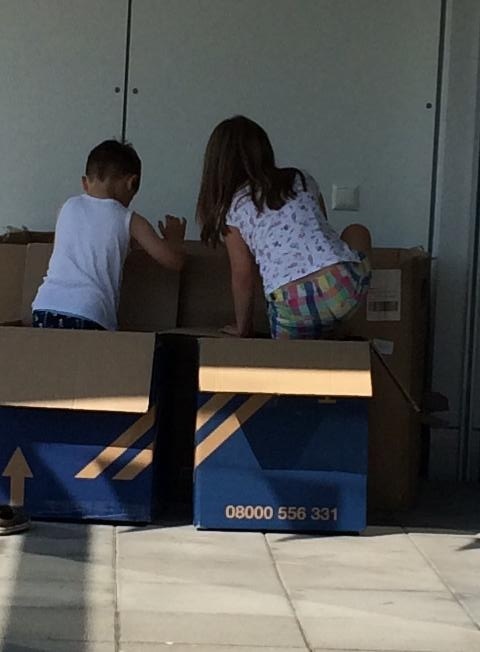 The kids LOVE the boxes, as kids are wont to do. They are using them for a variety of games, transport and cushioning. If you throw a roll of tape into the mix I’m not sure I’ll be seeing much of them over the next 4 weeks! Ah, great. Maybe Box City isn’t such a bad place after all!